Providing the first in-depth look at this breakthrough field, Combination Products includes practical guidelines and a detailed step-by-step process for the development of these novel technologies. 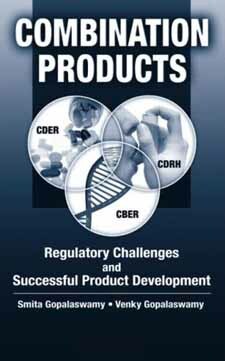 The book addresses the technical, scientific, regulatory, and quality issues that arise when combining drugs, biologics, and medical devices into a single product. Combination Products takes a practical, readily applicable approach to discussing the challenges, victories, and pitfalls associated with merging technologies and systems and how to implement these products into the market successfully and in a timely manner. Combination Products covers the process from start to finish, establishing a workable design and development plan complete with relevant definitions. It reviews FDA and other regulatory expectations and covers resource requirements, manufacturing pitfalls, post-launch compliance requirements, and agency audits and challenges.